Take home Ten 4 oz. packages of this acclaimed American charcuterie. Named for our hometown of Surry, Virginia, the sumptuous world-class flavor of Edwards Surryano Ham rivals that of imported Italian Prosciutto, Serrano ham from Spain, or German Westphalia. The Surryano Ham is hand-rubbed with a dry cure blend of salt and sugar, then smoked for seven days over hickory wood, and aged for more than 400 days to produce their signature mahogany color and rich, distinctive flavor. All Surryano Hams are crafted from pasture-raised Berkshire and Red Wattle hogs, which deliver an incredible nutty, umami flavor. When you combine the premium Heritage Breed pork with the timeless tradition of salting, smoking and aging, you get an American charcuterie reminiscent to the hams of old. 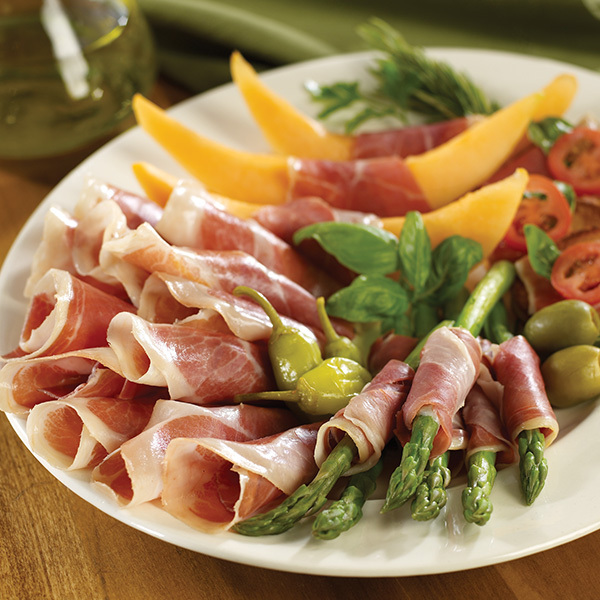 With the ham pre-sliced, these Surryano Ham Slices offer the simplest way to enjoy the best in American charctuerie.. Storage: No refrigeration necessary prior to slicing. After slicing wrap in foil and store in cool place. Best consumed within 12 weeks. Preparation: No cooking required. Sliced paper thin and ready to serve as a perfect complement to melon slices, olives, Spanish-style tapas...or on bread with olive oil and cheeses such as provolone & mozzarella. For optimal flavor, serve at room temperature.